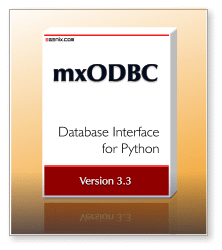 eGenix is pleased to announce the immediate availability of eGenix mxODBC™ 3.3.5 - Python ODBC Database Interface, with many advanced Python DB-API extensions and enhanced support of stored procedures with input, output and input/output parameters. Available for Python 2.4 - 2.7 on all major platforms. Documented the use of transaction isolation levels with mxODBC in a new section of the mxODBC manual. This features has been part of mxODBC for long time, but was never documented as such. Fixed the definition of the BinaryNull singleton added in mxODBC 3.3.4 to make it pickleable and protect it against recreation. Added support for bdist_wheels to mxSetup, which is used for creating distribution packages of mxODBC, to allow building wheels from the prebuilt packages, e.g. during installation via pip.